One of a set of circular porcelain plates. The centre painted with a view of the battlefield of Waterloo, green outer border with gilt lines. Gilt title on a white ground below the view '18 June 1815: north side of the Chateau Gomont, burnt on the day of the battle'. Château d'Hougoumont (originally Goumont) is a complex of buildings comprising a château and a farm situated in a valley directly below the escarpment held by Napoleon's armée du Nord and to the front of the west wing of the British line. The château and surrounding woodland was defended by the Guardsmen of the Light Companies of the British 2nd (Coldstream) and 3rd (Scots) Guards under the command of Lieutenant Colonel James MacDonnell. Wellington ordered MacDonnell to 'defend the post to the last extremity' and recorded in his despatches that in the mid-morning of 18 June 1815 'Napoleon commenced a furious attack upon our post at Hougoumont'. The attacks were repeated and repelled throughout the day. Only once did the French manage to gain acess to the complex; a determined attack by Sous-Lieutenant Legros (nicknamed L'enfonceur), wielding a huge axe broke through the North Gate. The guardsmen managed to shut the gate, trapping Legros and his troops inside and, more importantly, preventing further French incursions. Legros and his troops were duly dispatched with the exception of a young drummer boy. This short but important action was recognised as an important moment when an annuity of £500 was offered to the bravest Briton from the battle. The Duke of Wellington nominated Lieutenant Colonel McDonnell who gave half the sum to Seargeant James Graham an Irish non commissioned officer who during the defence of the château saved the life of an officer, that of his own brother and was among those responsible for closing the North Gate. Annually the Coldstream Guards celebrate the defence of Hougoumont with the ceremony of the 'hanging of the brick'. Napoleon and Wellington both recognized that whoever held the complex held the key to the battle. Initially Napoleon had regarded the complex as a tactical diversion. Taking the Chateau was not his intention - rather French activity around the complex would force Wellington to move much needed troops into the area. However, the diversion transformed into an all-day battle which drew in more and more French troops; the opposite to that intended. In 1783, Robert Chamberlain (c.1736–98), head of the decorating department for Dr. John Wall at Warmstry House, left the company to start his own porcelain decorating business in King Street, Worcester. The factory quickly established a reputation for the production of finely painted porcelain. Customers would choose the decoration for individual ‘cabinet’ pieces and views of country houses and figure subjects taken from prints of well-known paintings were fashionable. The factory built up a large library of source material for artists to work from; scenes from Shakespeare’s plays were copied from engravings published by John Boydell’s Shakespeare Gallery in Pall Mall. 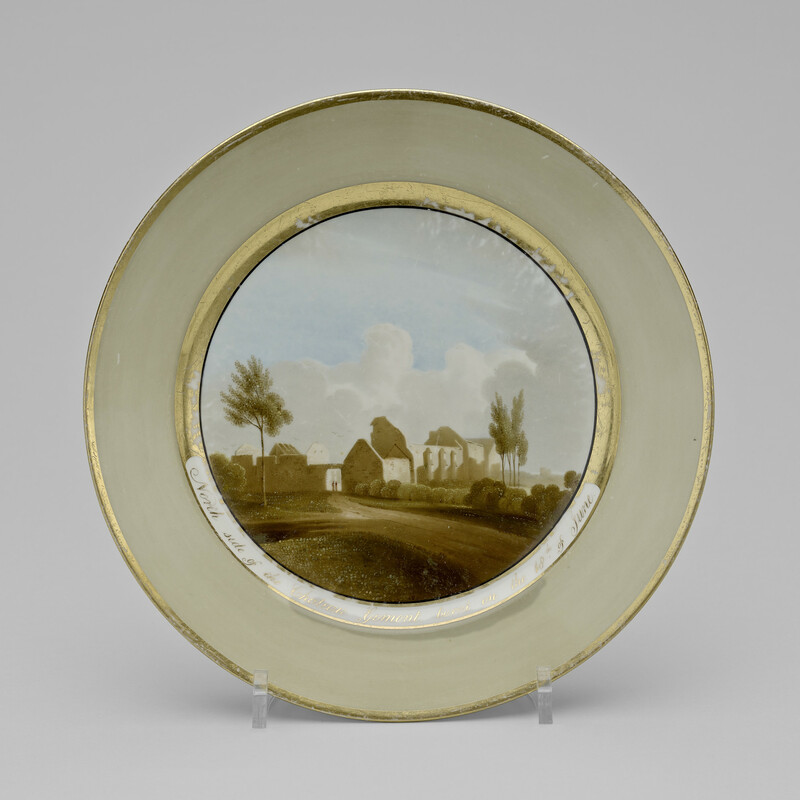 Soon after the allied victory at Waterloo the battlefield became a focus for tourists and mementoes commemorating the battle became very popular of which these plates, showing areas where significant events took place on 18 June 1815, are an example. These views are taken from contemporary engravings published in 1816. The Prince Regent awarded Chamberlain a Royal Warrant in 1807. Porcelain was sold at his shop at 33 Worcester High Street and through china dealers in other large towns. In 1813 Chamberlain opened a London showroom at 63 Piccadilly, moving to 155 New Bond Street in 1816. These plates are marked with the New Bond Street address. Ths plate is part of an order 'October 31st ... 1816 [part of an order for] His RH the Prince Regent. a set of '12 Plates, 8in. (views of Waterloo) – 73s. 6d. £44 2s 0d'. Throughout 2015, the 200th anniversary of the Battle of Waterloo, this exhibition will combine a themed trail through the State Apartments with a display of prints, drawings and archival material that explores the battle and its aftermath.